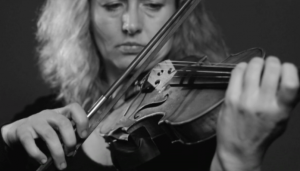 The last of the four Sverm videos by Lavasir Nordrum hast just been posted on Vimeo. The first short movie was titled Micromovements, then followed Microsounds and Excitation, and the last one is called Resonance. It has been exciting to work with the video medium in addition to the performances, and it has given a very different perspective on the project. Video artist Lavasir Nordrum hast just posted the third of four short movies created together with the Sverm group. The first short movie was titled Micromovements, and the second was titled Microsounds. This month’s short movie is called Excitation, and is focused on the first half of an even or action. This will be followed by a short movie called Resonance to be released on 1 January. 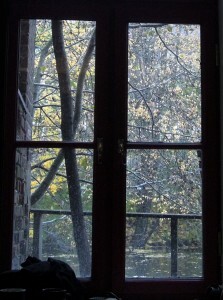 As I wrote about last month, the Sverm group has teamed up with video artist Lavasir Nordrum. The plan is that he will create four short and poetic videos documenting four of the main topics we have been working on in the Sverm project. The production plan for the videos is quite tight: we shoot content for the videos during a few hours in the middle of each month, and then Lavasir publishes the final video two weeks later. Last month he made the piece Micromovements. This month’s work is entitled Microsounds. 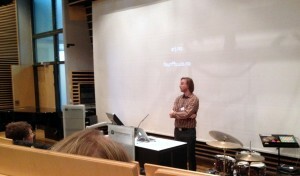 Alexander holding a keynote lecture at Musikkteknologidagene 2012 (Photo: Nathan Wolek). 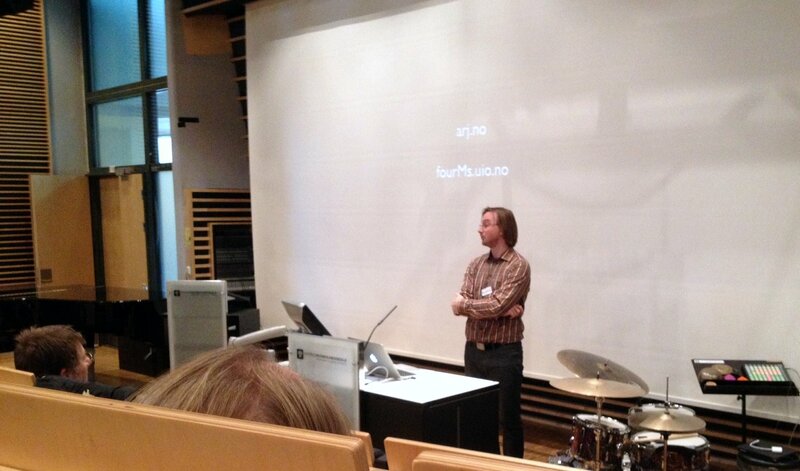 Last week I held a keynote lecture at the Norwegian music technology conference Musikkteknologidagene, by (and at) the Norwegian Academy of Music and NOTAM. The talk was titled: “Embodying the human body in music technology”, and was an attempt at explaining why I believe we need to put more emphasis on human-friendly technologies, and why the field of music cognition is very much connected to that of music technology. I got a comment that it would have been better to exchange “embodying” with “embedding” in my title, and I totally agree. So now I already have a title for my next talk! One of the “pieces” we did for the Sverm demo at Musikkteknologidagene 2012: three performers standing still and controlling a sine tone each based on their micromovements. Besides my talk, we also did a small performance of parts of the Sverm project that I am working on together with an interdisciplinary group of sound, movement and light artists. 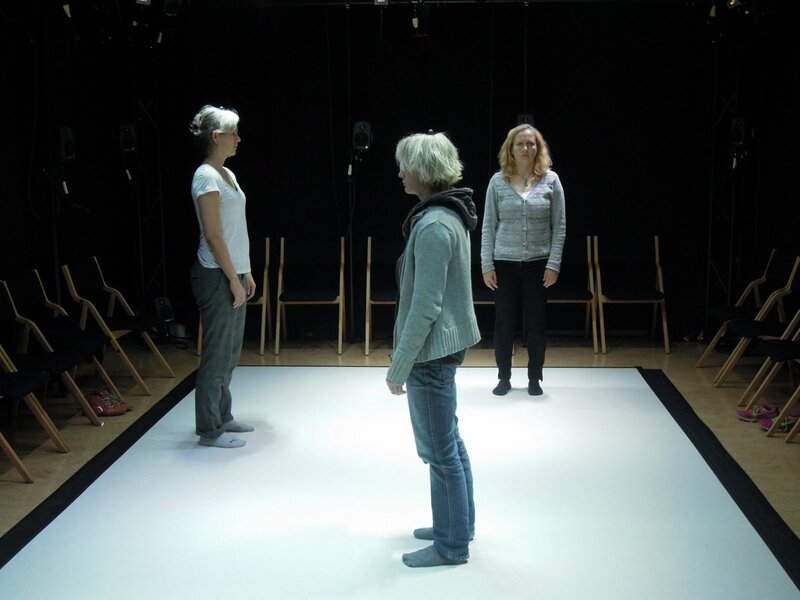 We showed three parts: (1) very slow movement with changing lights (2) sonification of the micromovements of people standing still (3) micromovement interaction with granular synthesis. 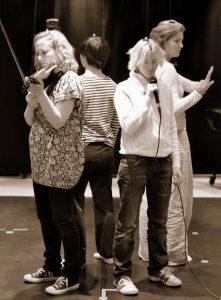 This showcase was based on the work we have done since the last performance and seminar. Besides the things I was involved in myself during Musikkteknologidagene, I was very happy about being “back” at the conference after a couple of years of “absence” (I had enough with organising NIME last year). It is great to find that the conference is still alive and manages to gather people doing interesting stuff in and with music technology in Norway. 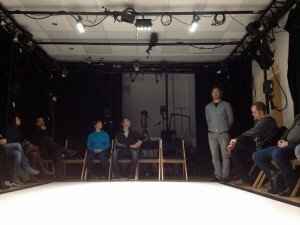 Alexander talking about the Sverm project and fourMs motion capture lab at Musikkteknologidagene 2012 (Photo: Nathan Wolek). When I started up the conference series back in 2005, the idea was to create a meeting place for music technology people in Norway. Fortunately, NOTAM has taken on the responsibility of finding and supporting local organisers that can host it every year. So far it has been bouncing back and forth between Oslo, Trondheim and Bergen, and I think it is now time that it moves on to Kristiansand, Tromsø and Stavanger. All these cities now have small active music technology communities, and some very interesting festivals (Punkt, Insomnia, Numusic) that it could be connected to. As expected, the number of people attending the conference has been going up and down over the years. In general I find that it is always difficult to get people from Oslo to attend, something that I find slightly embarassing, but which can probably be explained by the overwhelming amount of interesting things happening in this comparably little capital at any point in time. We had the first snow this year during Musikkteknologidagene, a good time to stay indoors at NOTAM listening to presentations. The first years of Musikkteknologidagene we mainly spent on informing each other of what we are all doing, really just getting to know each other. Over the years the focus has been shifted more towards “real” presentations, and all the presentations I heard this year were very interesting and inspiring. This is a good sign that the field of music technology has matured in Norway. Several institutions have been able to start up research and educational programs in fields somehow related to music technology, and I think we are about to reach a critical mass of groups of people involved in the field, not only a bunch of individual researchers and artists trying to survive. This year we agreed that we are now going to make a communal effort of building up a database of all institutions and individuals involved in the field, and develop a roadmap along the lines of what was made in the S2S2 project. All in all, this year’s Musikkteknologidagene was a fun experience, and I am already looking forwards to next year’s edition.